The vision that you have for your life is so within your reach. I will push you into it. 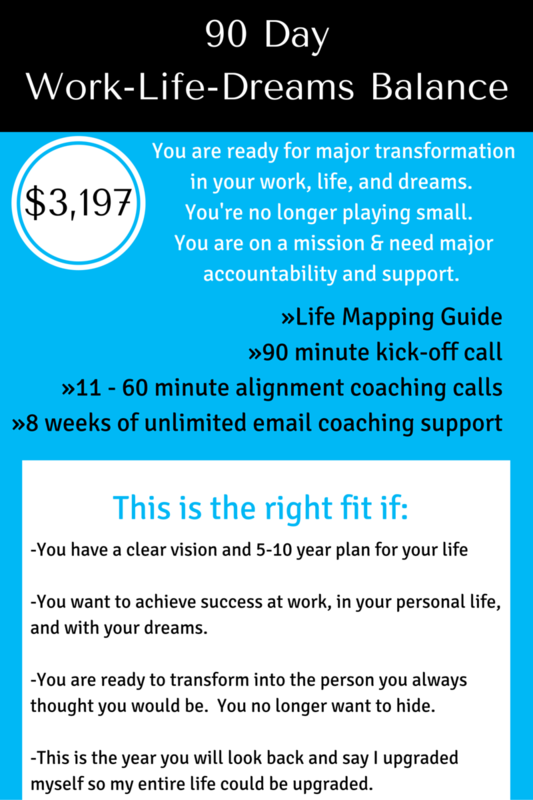 You will feel fully supported and encouraged as you journey toward the life that makes you happy and fulfilled – A life of working purposefully, living authentically, and dreaming actively. Your inner critic has been discouraging you and scaring you back into the small roles that make you feel big, but with a focused coaching and strategic success plans in place, you will no longer shrink back into being invisible in this world. Time for a full freakin’ transformation. This is not for you if reinventing yourself and launching your dreams is not on your list of things to do. In 90 days we will catapult you directly into the life you envision yourself living. In 90 days you will be doing what you’ve been too afraid to do, you will be who you’ve been too afraid to be, and you will be comfortable and confident strutting your stuff unapologetically. This is not for the feint of heart. Real willingness to move into being the person you know you were purposed to be is what it will take to make this a successful experience for you. Frequent accountability check-ins are vital to your success. You’ve officially hit a rut that is absolutely sucking the life out of you and you’re ready to escape and find yourself and your happiness again. 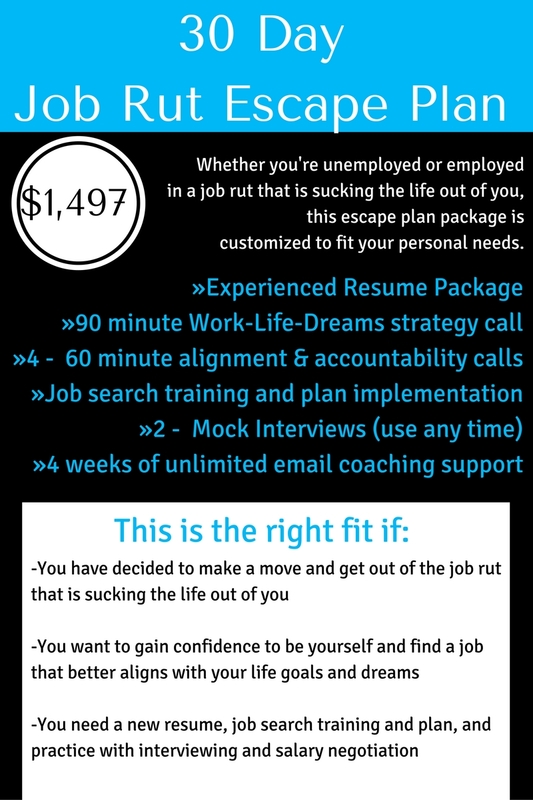 This is coaching and resume package is designed for professionals who are intentionally making moves in their jobs / careers. This is a good option for you if your goal is to get a new job in the next 3-6 months, but you’re not sure exactly what you want to do, what you’re next move could be, or you don’t have the resume and cover letter that will make recruiters and your next boss see you as a quality candidate. 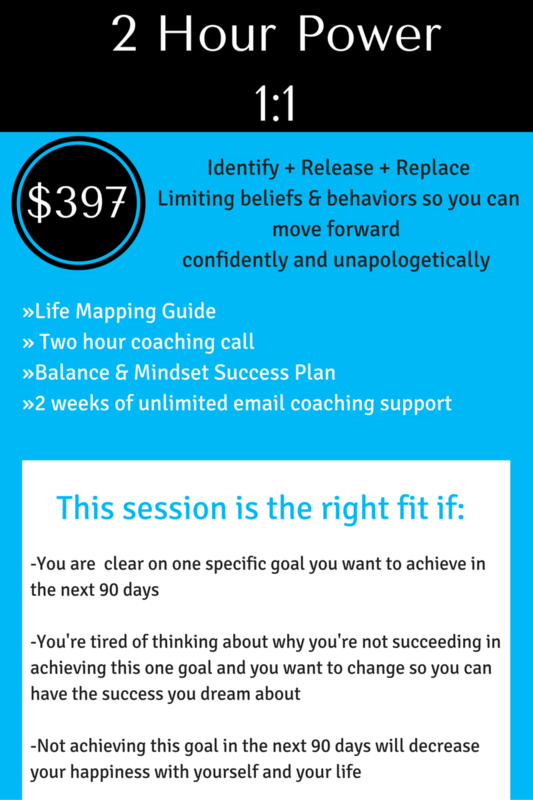 You’re set on accomplishing a big goal for your career, personal life, or your dreams, then this session is intended to free you from the negative thoughts and beliefs that are keeping you stuck and not confidently moving forward. You want to get to work on this goal without a shadow of a doubt that success is possible. A no-cost investment for you. We will identify what your authentic self is actually wanting and create a plan for obtaining the fulfillment you deeply desire.